In the UK the Griffon Bruxellois Club undertakes rescuing and rehoming of Griffons who due to unfortunate circumstances need to find a forever home. 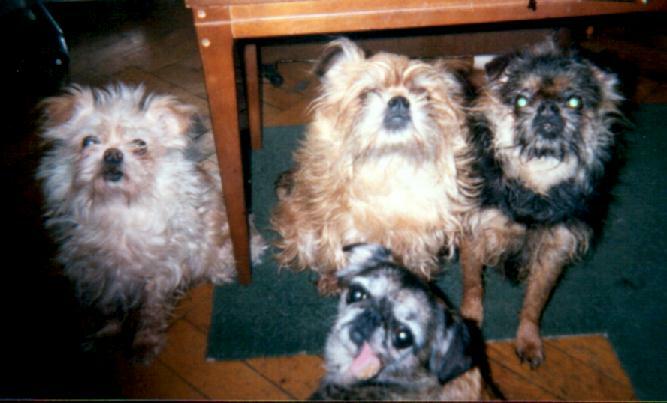 Griffon Bruxellois rarely need rescuing but there are occasions when an owner is no longer able to care for their dogs. If you hear of a Griffon in unfortunate circumstances or in a rescue centre please pass on the information to our rescue co ordinator. If you are able to offer a home to this delightful little breed please contact our rescue co -ordinator. There is a red rough male with health issues looking for a foster home. Please contact the Rescue co-ordinator if you think you can offer foster care to this little Griffon. Some older Griffons may need rehoming in their later years. Our older boys and girls may not look as handsome as our younger dogs but they do enjoy their later years and delight in living as part of a family.